Play Triple Cash Wheel Slot Online with 500 Free Spins! Triple Cash Wheel is a 5-reels, 60 paylines Online Slot Game by Bally. Triple Cash Wheel has Free Spins, Scatter symbols, Pick Objects and Wild features with an RTP of 95.21%. It is often said that good things come in threes and, with many exciting chances to win real money, Triple Cash Wheel online video slot certainly lives up to the saying. In Triple Cash Wheel slot game, you experience a trifecta of numerous ways for potentially major payouts. Set against a dark background, there is a classic retro style of an old slot machine yet with 3 entire reel sets – each stacked on the other. Higher value symbols include 3 flaming lucky 7s, 2 lucky 7s, a single lucky 7 (including a combination of these), and also a Bar 5. There is also a Wild, a Quick Hit Scatter, and a Cash Wheel symbol. Lower value symbols are represented by BAR, a BAR & BAR 5 mix, Bells, and cherries. Visually, Triple Cash Wheel online has vibrant and colourful graphics and the reels themselves stand-out even more with the darker backdrop. Upon wins there is also catchy and energetic animations that couples with upbeat sound effects. Being faithful to retro slots there is no background music, however, a tune plays per spin and a cheery melody highlights payouts. Head over to Rose Slots as 3 times could really be the charm with each spin of the Triple Cash Wheel online reels. Tripling your fun in Triple Cash Wheel slot is online casino games producer Bally Technologies. Bally has always maintained a reputation for releasing titles that immerse with impressive visuals, engage with straightforward gameplay, and reward with exiting opportunities for major payouts. Fans of online casino UK should stay tuned to RoseSlots.com for other Bally titles such as ‘Celestial King’, ‘Dragon Spin’, ‘Lady Robin Hood’, and ‘Rocket Returns’. Despite the unconventional appearance of Triple Cash Wheel online slot, gameplay is simple, fun, and easy to understand. With each of the 3 games having 5 reels, 3 wager rows, and 20 paylines (60 paylines combined), you may soon be calling this game a ‘Triple threat’. The Wild replaces all other symbols, except the Quick Hit Scatter, to complete wins. When 5 Wilds land on the reels, you will be celebrating with an up to £2,500 win. This is followed by 5 Lucky 7s awarding £1,000. Betting in Triple Cash Wheel slot has a flexible range from £1 to £100. A wager of £100 unlocks all paylines and also all Bonus features. If you need a break but still want to keep the action going, simply set the AutoPlay for 10 to 200 continuous spins. You can also play Triple Cash Wheel online anywhere and at any time as it is fully compatible as a mobile slot as well as on other devices such as tablet and desktop. With up to 3 reel grids in play on a single spin and many bonus features, the theoretical RTP is estimated at 95.21%. The Quick Hit Scatter can land on the connecting reels and, when 9 appear, you will increase your win by a 1,500x multiplier. 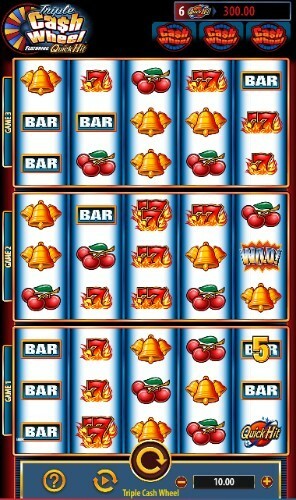 However, the Cash Wheel Bonus as represented by the 3 wheel icons on top of the reels, is the most exciting Bonus round. When 3 are lit up on any random spin, the Bonus is launched that lets you choose a ‘?’ symbol from among 21 squares. When you match 3, you can win up to 3 Spins of the prize Wheel with a 3x wheel multiplier. The Wheel is then spun to reveal a prize. This includes the chance to win £100 and 10 more free games with a 3x multiplier if the wheel stops on ‘Free Games’.